It takes a lot of effort, and money to train a pathologist, equip him/her with all the instruments required, and then use the skills in a backward area without proper facilities. But the advent of digital imaging has solved many of our troubles. Telepathology made sure that we do not need a pathologist physically present at the site, to render a diagnosis. But microscopy and digital imaging of the biopsy/tissue fragment was still a hassle. Now we have done better. You don’t even need a microscope to send a microscopic image over the network!! Researchers from the Univ. of California worked with high-powered LED – which retails for just a few dollars – coupled with a typical camera phone to produce a clinical quality image sufficient for detecting in a field setting some of the most common diseases in the developing world. 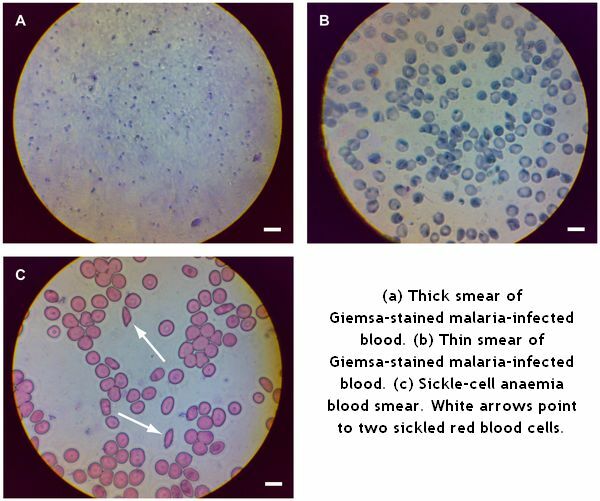 The newly developed technology, CellScope, allows for average cell cameras to be retrofitted with powerful microscopes, able to detect malaria parasites, and even fluorescent marker-stained tuberculosis bacteria. 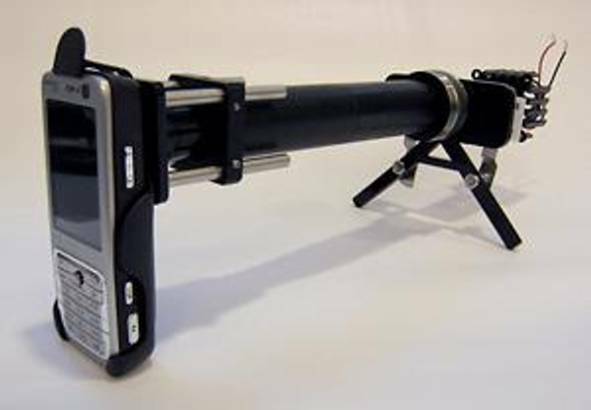 Thus you have your humble cell-phone transformed into the sherlockian “cell-scope”. “The images can either be analyzed on site or wirelessly transmitted to clinical centers for remote diagnosis. The system could be used to help provide early warning of outbreaks by shortening the time needed to screen, diagnose and treat infectious diseases,” University of California in San Francisco (UCSF)/UCB Bioengineering Graduate Group graduate student David Breslauer adds. CellScope could also provide remote access to digitized health records, and would be amenable to epidemiological studies, using triangulation or global positioning system location data, such that outbreaks could be monitored as they happen. So maybe i could click a photomicrograph of that mole on my friend”s forearm, twitter it to my onco-pathologist friends, who view it on their smartphones and twitter / message their diagnosis back to me. Simple and fast, especially with my own group of pathologists on the network. Kindle is a new device that is changing the face of reading. The best of the current lot of e-book readers, Kindle is a boon for medical students and professionals, allowing them access to hundreds of books on the go!. The basic functions of Kindle can be seen here.Kindle, now in its third avatar, the Kindle Dx (Deluxe) boasts of more advanced features, like PDF support (experimental) , longer battery life, 5-way Controller and sleeker design. Check out more features here.. You can view it from all angles, zoom into any area and look at its features. Easy for medical students to keep up with all their scheduled reading. You can download and read reference materials that you have read previously to refresh your memory.You can seek out new textbooks to look for answers too. Seeking out symptoms, conditions, and other relevant information is easy.You can view photos on the Kindle if you need to see pictures of various signs and symptoms conditions. Study medical texts and highlight portions of texts / make notes on the Kindle as you go. Zoom into images for micro details.Bookmark and annotate important portions. .Multiple books can be read at once, no need to carry a JUMBO Grey”s anatomy or Robbin”s Pathology encyclopedias !! It boasts of storage capacity of 1500 / 3500 books, depending on the Model. You can listen to music while you read. Inbuilt Text-to-Speech feature lets you listen to your favorite books. It has a clear policy for returning the instrument or any content bought ( within 7 days of purchase) and also One year limited warranty. The kindle library boasts of more than 300,000 books for download, and many more added regularly. Priced at 300 and 500 $$ , and weighing approx. 300 and 500 grams (depending on the model) it is still too pricey for open embracing of this technology. Some libraries have started lending out Kindles ( with preloaded content) to its patrons. Personally speaking , i can see a lot of content being adapted for Kindle, provided the machine becomes less expensive. Also , many more wireless features ( like chat, email, videos etc) need to be added. If more such functionality is added to justify its high prices, i expect a LARGE number of medical students turning to Kindle. SCORM content, ie the Sharable Content Object Reference Model is easy to add everywhere as it is compatible with most learning management system. Since moodle is the best opensource LMS, it uses the following SCORM compatible template to add chapters. U will reach language selection page, choose English. Explore the teacher dashboard. 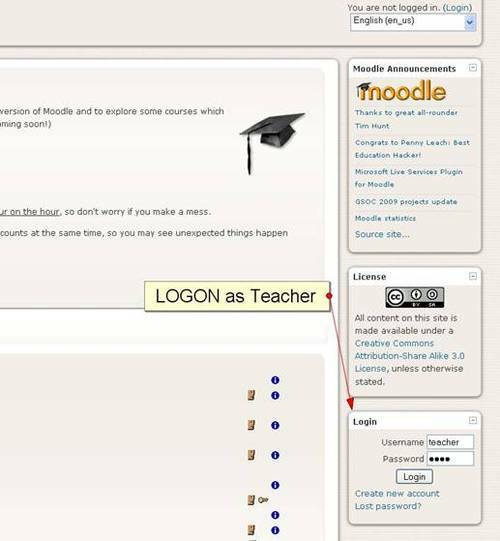 Teacher dashboard allows a teacher to add content and access students’ tests/activity log/etc. Point- Always create (and store) all new content as SCORM compatible. Use flash files, HTML, simple JAVA, Quicktime/wmv for videos, powerpoints etc. to create a packet. Thus each elearning module can be saved as a collection of compatible media.